The video covers all of the following categories, and is designed to allow you to complete all the requirements for maintaining your bike to BMW specifications. It is designed for ALL R1200 series motorcycles (Not including the R1200 cruisers), though it is centered around the R1200GS since that is what Jim had available for filming. Jim has included the necessary tools, supplies and torque specifications to complete all the listed services. Jim has also added many helpful tips and notes to make this as simple as possible. Consider this, the tool to remove and install the alternator belt is nearly $150, Jim teaches you how to do it with no special tools, a savings of $125 right there! A typical 6K mile (10k km) service will run you around $300-450, depending on location. The brake bleed alone can run as high as $400. What Jim did not include, since he felt they that it was self explanatory, was how to check your oil, tires, and lights. Also not included is how to check spoke wheels since Jim did not have a spoked wheel bike available -this will be available on the Companion DVD. Those of you with 1100/1150 BMW R series bikes can also benefit from this video in that most of the service items are done the same way, and with the same tools. A DVD covering the 1100/1150 will shortly be available. Some items, like Alternator belt changing, non-servo-brakes, and final drive fluid changes are different, and will be covered in the upcoming BMW R Series Companion DVD. This DVD will also cover the addition of various farkles like Jesse bags, a Blue Seas./Centech Fuse Box, and many other accessories like GPS and XM radios. There is a mistake on the DVD, in the valve adjusting procedure section on the torque value of the three rocker arm support bolts, T45 head. This is ONLY applicable IF you adjust the rocker arm end play. Not for simple valve adjustments. The torque value listed was 40nm, and the real torque value is 20nm. 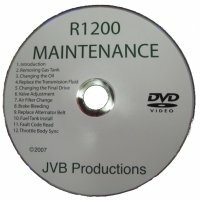 Jim had originally verified the torque value with both the factory manual on DVD, as well as online with a reputable source. Either they are both mislabeled, or they are not clear. Nonetheless, the correct value is 20nm, not 40nm. The head bolt, 15mm, torque value is correct as stated.